WASHINGTON, Jan. 17, 2017: TCG has been ranked No. 3 Best Workplace in Technology among small and medium-size businesses by Fortune and Great Places to Work. The rating is based on the results of an anonymous survey of TCG employees, compared to the surveys submitted by other companies with an interest in being a great place to work. 99% of TCGers believe management trusts people to do a good job without watching over their shoulders. 98% report that people are given a lot of responsibility. 99% report that management’s actions match words. 99% report that management delivers on its promises. Understanding that employees are a company’s greatest asset, TCG strives to maintain a positive company culture and to be an enjoyable place to work. In addition to medical, dental, vision and retirement benefits, TCGers enjoy commuter benefits, parental leave, adoption assistance, virtual butler, emergency home care, financial planning assistance, and numerous other hard and soft benefits. TCGers organize monthly social and charity sprees for activities ranging from bubbleball to scuba diving to community clean-up. This is TCG’s 19th award for maintaining a positive company culture. The Best Workplaces in Technology rankings are based on feedback from more than 42,000 employees at Great Place to Work–Certified organizations in the tech industry. Employees completed an anonymous Trust Index© survey, answering questions about how frequently they experience the behaviors that create a great workplace. Survey statements address the transparency of communication, degree of collaboration, quality of benefits programs, opportunity for professional development and support for work-life balance, among other workplace characteristics. Results are highly reliable, having a 95% confidence level and a margin of error of 5% or less. 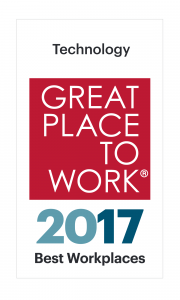 Winning a spot on this list indicates a company has distinguished itself from its peers by creating a Great Place to Work for All. Rankings rewarded organizations where not only the majority of their employees experience a great place to work, but experiences are highly consistent regardless of gender, race/ethnicity, job role or other personal characteristics. Results were considered based on the complexity of the employee population and relative to peer performance. Organizations with fewer than 1,000 employees competed in the Small and Medium category, and those with 1,000 or more employees competed in the Large category.